we’ve secured a few recipes from it! 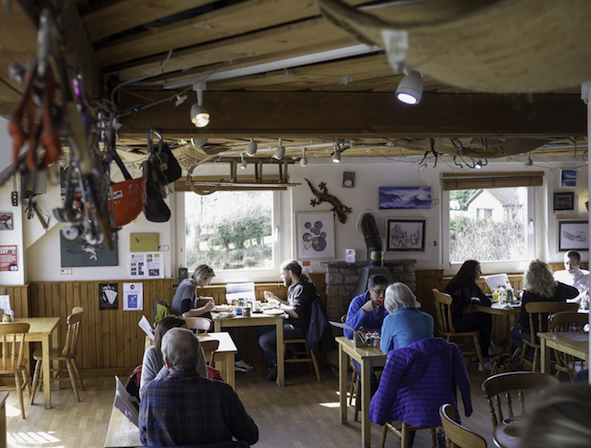 In our March issue, Garry tests out the Mountain Cafe’s breakfast (reputedly the best in the Highlands) so we thought it only fair to follow this up with lunch and afternoon tea! Click here for Kirsten’s recipe for Sweet Potato Quiche, and keep reading for an old favourite – Whisky Fruit Cake. 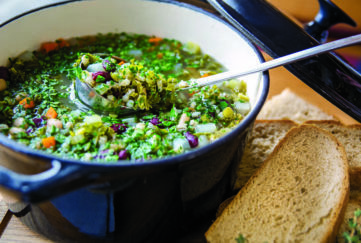 “This recipe originally came from my absolute favourite chef, Alison Holst. 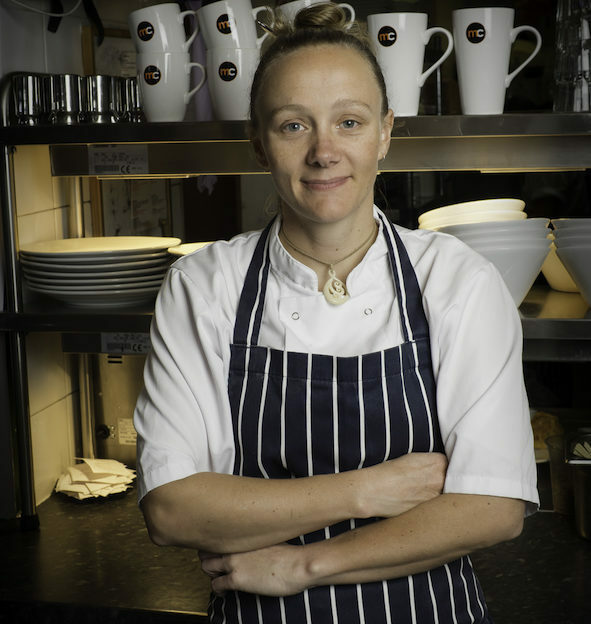 This incredible lady revolutionised Kiwi cooking in the eighties. I have tweaked her recipe very slightly, adding whisky to keep the Scots happy and an apricot glaze to pimp it up. Grease your cake tin and preheat your oven to 170.C (150.C fan). In a saucepan big enough to take all the ingredients, place your dried fruit, glacé cherries, orange juice and 120ml of the whisky. Bring to the boil on a medium-high heat, then reduce to a simmer for five minutes. Take off the heat and stir in the butter until it has melted. Leave till the mix is cool enough to hold your finger in. Add the dark brown sugar, the remaining 75ml of whisky and the eggs and beat with a wooden spoon until really smooth and glossy. Sieve your flour and baking powder over the wet mix, add the flaked almonds and stir again until everything is fully incorporated. Tip the batter into your greased tin and bake for 60 to 70 minutes until a skewer comes out clean. Leave the cake to cool in its tin on a rack. Take the cake from the tin and put on a serving plate. You now need two medium-sized saucepans. In one of the saucepans, melt the apricot jam and the whisky over a medium heat until it is hot and runny. Sieve this into the second pan, discarding any lumps of fruit from the sieve, to get a smooth glaze. Heat the glaze again until it is hot, then brush about half of it over the top of the cake. 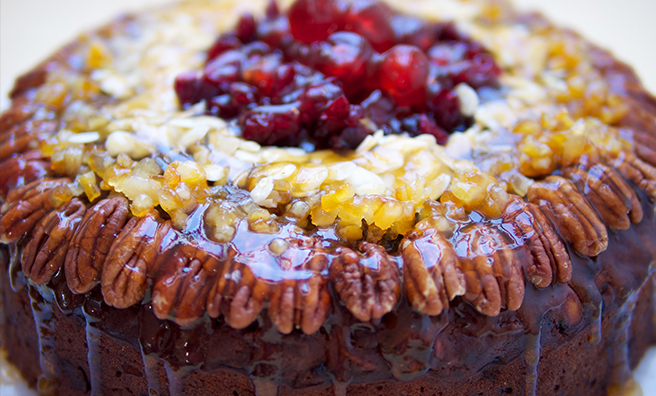 Garnish the top with nuts and fruit as elaborately (or not) as you like. Heat the glaze up again, adding a little more whisky if it is too thick to pour, then drizzle it slowly over the top of the cake until it is well coated. Leave to cool before serving. The whisky fruit cake lasts for three weeks in an airtight container at room temperature, but it also freezes really well if you have some left over – no chance in this office! Give it another wee drink of whisky once it has defrosted. 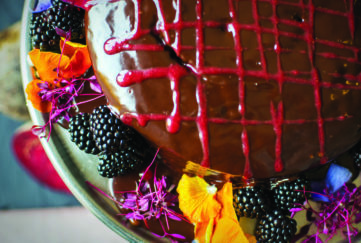 You can find loads more great recipes, and mouth-watering images in Kirsten’s new book. 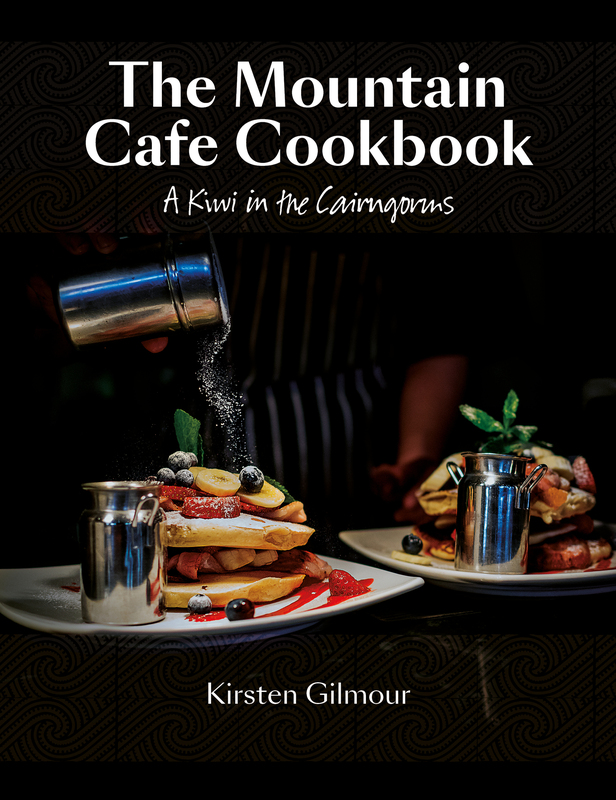 Pick up a March Scots Mag, too, to find out more about Kirsten and the Mountain Cafe.